5G technology is expected to dramatically change how fast things move over the internet. About 100 times faster than 4G, it will allow movies to download in a second or two instead of minutes, homes to run on smart appliances, and vehicles to be driverless. The Chinese have moved fast to dominate the 5G market. Beijing has poured billions of dollars into developing 5g technology, and since 5G relies on miles of fiber optic networks that cost tens of billions of dollars to install and billions more to operate, China has been offering to build those networks for cheap, and countries all over the world have been signing up. Experts say China’s headstart could determine how 5G is developed and accessed by the rest of the world. “If you’re first out of the gate with technology like this, if you’re the first mover, then you have a way of setting the standards that other countries are going to use,” said Hudson Institute Senior Fellow Arthur Herman in a phone interview with Breitbart News on Monday. So far, 64 countries have an agreement or have announced testing of 5G gear made by Chinese tech giant Huawei, including some of the U.S.’s closest allies: Britain, Germany, and Japan. 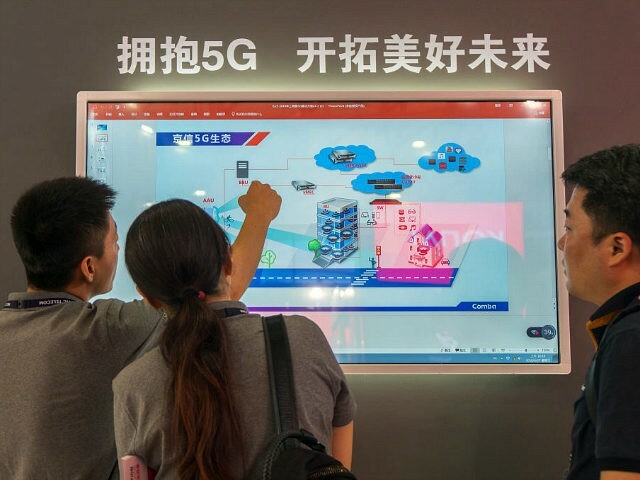 China’s spending on building 5G since 2015 has exceeded the U.S. by $24 billion, according to recent Deloitte study. Last year, Huawei had 22 percent of the global market share for 5G equipment, and another Chinese company, ZTE, had ten percent, according to the research firm IHS Market Ltd. Finnish company Nokia has 13 percent and Swedish company Ericsson has 11 percent. China’s dominance could mean the U.S. may also have to use Chinese systems, which experts say has huge security risks. For one, U.S. troops and intelligence officials serving on bases overseas would likely have to transmit information over Chinese networks. “Although the really sensitive stuff and highly classified stuff will continue to be carried on separate networks, the point is a lot of the ordinary traffic that they do, a lot of the give and take will all take place on wireless networks,” Herman said. He said the worst case scenario would be Trojan horse-type applications built into the technology that would allow China to intrude, listen in, or steal data flowing through the networks. “It’s likely that the first 10 minutes of the next great war will be fought first in the cyber domain. That’s how important this is,” he added. China is not just moving in 5G. It has made it a goal to dominate the markets for other advanced technologies such as artificial intelligence, robotics, biotechnology, and quantum computing as part of its “Made in China 2025” plan, and experts worry China could gain an advantage in those technologies too. “What we’re talking about in that new technology is national security and who sets the stage, who sets the standards going forward,” retired Navy Adm. Gary Roughead, co-chairman of National Defense Strategy Commission, said at a November 27 Senate Armed Services Committee hearing. Some experts and lawmakers fear the Trump administration has no plan to stop Chinese dominance in 5G. “China is sprinting ahead. We don’t have a plan. We don’t have to be afraid of China, but if we don’t have a plan, they will win. And we cannot afford to lose the 5G race,” Sen. Ed Markey (D-MA), a member of the Foreign Relations Committee, said Thursday at a conference hosted by the Center for Strategic and International Studies’ China Power Project. “It is going to turn the whole world, and all of the technologies into it, into a digital world. Every device. China is ahead of us. We don’t have a plan that anyone in this room could articulate with regard to our plan in 5G. We couldn’t even talk about the names of the companies in the United States who are the leaders in 5G,” he added. Experts agree if the U.S. does not have a plan by World Mobile Congress in Barcelona in March, China’s dominance in 5G will be a foregone conclusion. Ganley said once countries make decisions and sign contracts, it is hard to reverse. “It’s like getting your jaw drilled for dental implants and having a whole new set put in, and somebody telling you you got to rip them all out,” he said. “We don’t have much time, and action needs to be taken now,” he said. A recent Wall Street Journal report said that U.S. officials have started a campaign to warn allies about the risks of relying on Chinese vendors to develop their 5G infrastructure, and are considering financial aid for telecommunications development in countries that forego Chinese equipment. The 2017 Chinese Cybersecurity Law allows the Chinese government to conduct oversight on companies’ networks, including by conducting security spot-checks. Herman said more needs to be done than just warning or scolding allies. He has argued for the U.S. to introduce a new wholesale model that would make developing 5G technology much cheaper for domestic operators. The current model has governments selling portions of spectrum to the highest-bidding large telecommunications companies. Those companies then rely on cheap Chinese development of 5G networks in order to bring down their costs and boost profit margins when they allocate spectrum to their customers at a “take it or leave it” price. Herman argues that the U.S. should build a carrier-neutral 5G network and lease spectrum directly to large and small customers based on how much they want at a much cheaper price and allow them to build out the necessary infrastructure. He said countries would then consider going with the U.S. model instead, particularly due to the little trust countries have for the Chinese government and Chinese products. “It fires a warning shot across the Chinese bow,” he said. Herman said he is optimistic the administration will have a plan by the March gathering. “I’m pretty hopeful that the stars are in alignment, so that we can get something together before that all-important meeting in Barcelona of the World Mobile Congress, because that’s the one in which China will be looking to do a victory lap and looking to be the one that emerges on top,” he said. “But if the big talk isn’t about China but it’s about America looking at and launching a new model for allocating spectrum, then that will be a big step in the right direction,” he said.